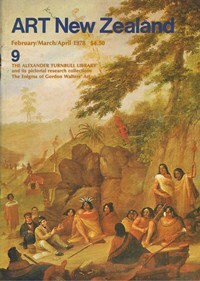 published by Thames & Hudson, London, 312 pages. I tend to regard David Hockney as a stylish, if somewhat light-weight artist, who brings to his art a sociability that can be popular and gently amusing in a way that renders it admirably enjoyable without the pretence of profundity or true originality. It is not that he is without seriousness as an artist who counts, but that he stands to one side of what could be described as the core of modernism since 1960, and this regardless of any role he played in the emergence of the 'Pop Art' idiom. David Hockney by David Hockney is a book where larger questions of artistic significance can be partly ignored. It is the sociability of Hockney's work, and of the man, that becomes the basis from which the book can be approached. acrylic on canvas, 2440 x 2440 mm. 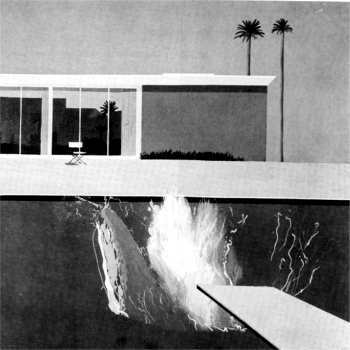 Henry Geldzahler's introductory essay contains many illuminating comments on Hockney's attitudes to figurative and abstract art, on attitudes to technique, on his personal relationships and mode of living. And yet, while making critical assessments of his work and examining the many influences on Hockney as his art developed, rarely does Geldzahler delve deeply or attempt any critical evaluation of Hockney's standing in the world of contemporary art. In a book where the personal approach is emphasised it may well have seemed that such an assessment was uncalled for, as would befit a friend whose likeness frequently appears in the artist's later works. Geldzahler catalogues the formal aspects of Hockney's development as an artist and, in I more specific terms, his approach to portraiture. He notes the greater; artistic freedom displayed in the portraits when the person portrayed is an acquaintance of the artist, and observes that 'Portraits of two people occur more frequently than single figures'. 'There is a strain in Hockney's work', writes Geldzahler, 'which runs counter to and complements his love of the Mediterranean and Southern California. He refers to it as his fondness for 'Gothic gloom'. He then points out how Hockney's illustrations to Grimm's fairy tales offer the best manifestation of the 'Gothic gloom'. The illustrations after Hockney's drawings, etchings and paintings extend back to his Grammar School days, the earliest being one for a newspaper advertisement competition, a forerunner to the tea paintings which marked his early association with English-style 'Pop Art'. The works illustrated form the major portion of Hockney's output up to the beginning of 1976. Accompanying the main text are 4 reproductions of documents such as letters and school reports, family and other related photographs, some of which bring out the clowning aspect of Hockney's personality. One admirable aspect is the use of margin references to the reproductions where these are mentioned in the text. It is therefore easy to quickly turn to the appropriate illustration to clarify the point being made by the artist. The main text is a transcript of Hockney's own account of his career up to mid-1975. It is an edited, and chronologically re-arranged, version of tape-recorded conversation. This accounts for some repetition, plus other aspects with which a reader could find literary fault, but it also gives to the text a liveliness it might not otherwise have possessed. There are parts where a reader's interest might flag, but over-all the material is reasonably consistent. Hockney's account documents certain aspects of his life style in which he can be tactful, occasionally witty and frank: 'Peter and I lived together. Peter's the only person I've really lived with; we were lovers. I've lived with other people, but not really as lovers.' It is, however, his comments on his work that occupies a good measure of the text. Sometimes he will describe purely technical matters: 'If you put a little detergent into this diluted [acrylic] paint, then paint on to unprimed raw cotton duck, the detergent has the effect of breaking up the oil in the cotton, making it much more absorbent, as though you're painting on blotting-paper'. Or he may confess that: 'Sometimes I'd take slight liberties with the stories' when doing illustrative work, often adding to the dimension of the story. There is quite a bit about his links with, and interests in literature, as well as in opera. Or it may be the effect of another painter on his work, such as the steadying influence of Ron Kitaj while Hockney was still a student at the Royal College of Art. However, as Hockney himself says, 'It is very good advice to believe only what an artist does, rather than what he says about his work'. Despite this, the book is a must for any fan of David Hockney as a person and as an artist.